NEW BOOK written by Marko Iršič – Communication Wellness is here! 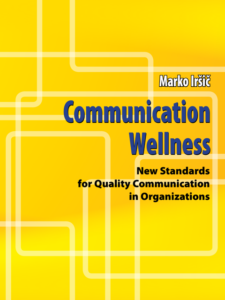 Communication Wellness, New Standards for Quality Communications in Organizations, book written by Marko Iršič was just published! The book deals with new standards for quality communication in organizations, and offers a new approach on how to maintain quality communication when difficult conflicts take place. It proposes a new approach to perceiving, assessing, managing and repairing the quality of communication and offers some practical tools for that. Communication Wellness is a true communication pampering, so far available in English only. Marko Iršič is one of the leading experts in the field of communication and conflict management in Slovenia. He is the founder of the Rakmo Institute, Master of Educational Studies, Coach, Mediator and Trainer of mediators and also the author of books The Art of Conflict Management (2004) and more recently Mediation (2010). He obtained the license of Master Practitioner of Neuro Linguistic Programming and has a degree – Master of Educational Studies in Leuven in Belgium. He currently works as a trainer in communication, conflict management and mediation. Also available as e-book (e-pub) for 9,90 €.